Waves have long fascinated artists. "Seascapes" are a recognized genre of art. This image and its companions are a new departure in John Art. 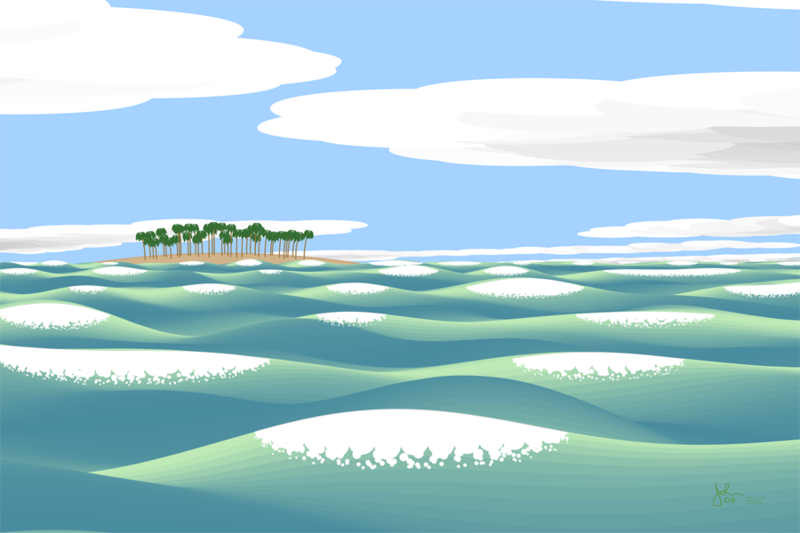 Both the sky cloud pattern and the ocean surface are generated by a series of sinusoids with random amplitudes which is a technique I have not used before. In other words they are examples of "noise" -- a phenomenon much seen in the real world. There are two sets of sinusoids -- one which represents the noisy and chaotic ocean surface, and another that runs only in the near-far direction and represents coherent "cuspy" waves in an orderly sequence. Either without the other would give a dull and uninteresting picture. The sinusoids generate an undulating wave surface, but the interesting part of a stormy ocean is the breaking crests ("whitecaps") which represent the nonlinear behavior seen in all waves if their amplitude becomes large enough. The program looks at the wave amplitude and if it rises above a certain value it creates a "crest". In this picture the crests have "bubbly" bottom edges, while in the others of this series different treatments have been made. This is a cheerful daytime view of the ocean, and there is a small islet in the background with palm trees. The coloration is intended say "ocean" to the viewer, and is not necessarily realistic.